Time signature is usually the first thing you need to determine about a song you want to transcribe. The time signature answers two questions: 1. How many beats are in each measure? and 2. What kind of beats are they? Luckily, this is rarely a difficult thing to find. Listen to the song. Tap your feet as if you’re walking along with the steady beat of the music. Make sure you’re finding the BEAT (steady and consistent) and not the Rhythm. Narrow it down and focus on one voice/instrument, preferably one that is doing something repetitive. Some good examples would be drums, piano, or bass. Count how many beats it takes before the rhythm repeats itself. You will most likely come up with a number between 3 and 8. Congratulations! You have now answered question number 1. Now zero in on the individual beats (the space between each toe tap). How are they split up? Commonly, you will hear 1-4 individual notes inside each beat. This helps you answer question 2. If you counted 1, 2, or 4; then your music probably uses quarter notes as the base. If you counted 3; it uses eighth notes. At the beginning of your music staff, the time signature will look like 2 numbers stacked on top of each other. The top number should be whatever you got in step 2. The bottom number is either a 4 or an 8 depending on your base note value (step 3). Quarter note base means use a 4, eighth note base means to use an 8. 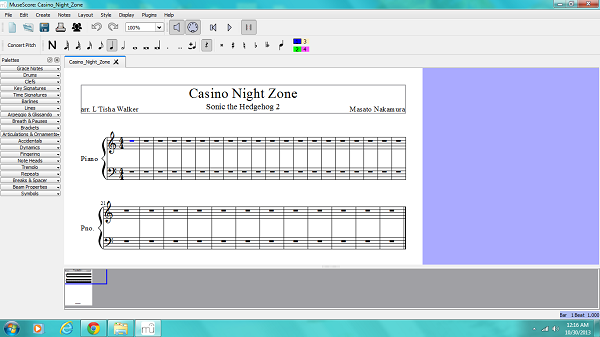 For Casino Night Zone, the time signature is 4/4. As a reference note, the 3 most common time signatures are 4/4, 6/8, and 3/4. If you come up with something like 8/4, you probably mean 4/4 and the rhythm was just 2 measures long. There are always exceptions to these guidelines, but the process outlined above will still work. If you’re getting into more complex and uneven metered works, you probably don’t need my tutorial. I’ll be happy to answer any questions you leave in the comments section below. Previous post: Where was MuseScore when I was in College? Next post: Little Man turns 1: Yoshi Birthday Cake!